The mixed reality market was valued at USD 48.1 Million in 2016 and is expected to reach USD 453.4 Million by 2020, at a CAGR of 75.2% during the forecast period. The base year considered for this study is 2016 and the forecast period is 2016–2020. Research methodology includes the use of primary and secondary data. Both top-down and bottom-up approaches were used to estimate and validate the size of the market, as well as that of the other dependent submarkets, in the overall mixed reality market. Key players in the market were identified through secondary research. Secondary sources comprised annual reports, press releases, and investor presentations of companies; white papers, certified publications, and articles from recognized authors; directories; and databases. Secondary sources also consisted of AR/VR Association, EuroVR Association, Consumer Electronics Show, and Mobile World Congress. The value chain of the mixed reality market includes original manufacturers for head-mounted displays, wearable device manufacturers, and distributors. Major companies that are part of the value chain include Atheer, Inc. (US), Canon, Inc. (Japan), DAQRI LLC (US), Eon Reality, Inc. (US), Layar B.V. (Netherlands), Magic Leap, Inc. (US), Meta Company (US), Microsoft Corporation (US), Seiko Epson Corporation (Japan), and Sulon Technologies (Canada). The mixed reality market was valued at USD 48.1 Million in 2016 and is expected to reach USD 453.4 Million by 2020, at a CAGR of 75.2% during the forecast period. The penetration of head-mounted display devices in the gaming, sports, and entertainment space; evolution of hardware and software components for reality technologies; and increase in internet connectivity are the major factors driving the mixed reality market. This report covers the mixed reality market based on component, device, application, and geography. Industrial application is expected to hold the largest share of the overall market during the forecast period. Major factors contributing to the growth of this market include the increased adoption of head-mounted displays for industrial applications, growing use of advanced reality technologies for employee training, and extensive research and development activities to launch new mixed reality products. The mixed reality market for software is expected to witness high growth owing to the strong R&D in this area. The major factor contributing to the growth of this segment is the gradual commercialization of mixed reality products that would enable the development of software development kits (SDKs) to help in the smooth functioning of the entire system/product. It is also expected to promote application developers to design new apps to further enhance user experience. The head-mounted display (HMD) wireless segment is expected to record the highest growth rate in the mixed reality market during the forecast period. The major factor attributed to the growth of this market is the increasing demand for wireless HMD devices which provide enhanced convenience to users while visualizing images (HMD wired devices could lead to user discomfort). 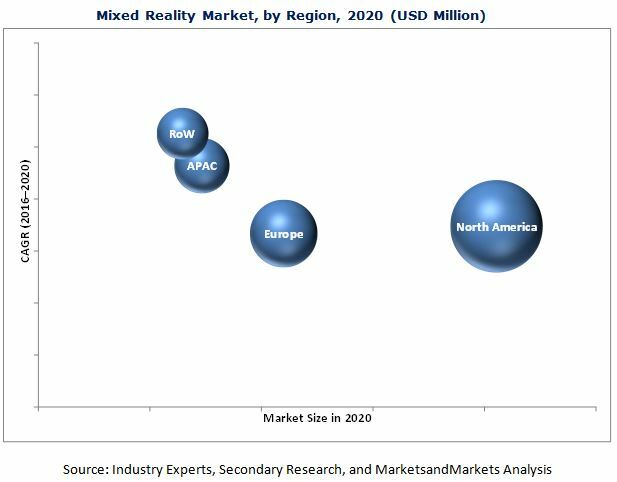 North America is expected to lead the mixed reality market in terms of size due the significantly high adoption of mixed reality products in this region. Technological advancements and product launches by players in this region are likely to contribute to the growth of this market. The presence of major mixed reality companies, such as Microsoft Corporation (US), Atheer, Inc. (US), DAQRI LLC (US), Eon Reality, Inc. (US), Magic Leap, Inc. (US), and Meta Company (US), in this region is also expected to drive market growth. The limited battery life and image latency affect the performance of mixed reality devices. These are key factors restraining the growth of the mixed reality market. This report discusses the drivers, restraints, opportunities, challenges, burning issues, and winning imperatives pertaining to the mixed reality market. It also analyzes the current market scenario and forecasts the market size till 2020. A few major companies operating in the mixed reality market are Atheer, Inc. (US), Canon, Inc. (Japan), DAQRI LLC (US), Eon Reality, Inc. (US), Layar B.V. (Netherlands), Magic Leap, Inc. (US), Meta Company (US), Microsoft Corporation (US), Seiko Epson Corporation (Japan), and Sulon Technologies (Canada).